Yesterday we went to Dry Falls (a.k.a. Sun Lakes). It is exactly what the name implies. An old, dried-up falls. But it’s actually really quite cool. It’s Washington’s Grand Canyon. Really quite impressive. It is actually an ancient geological wonder. 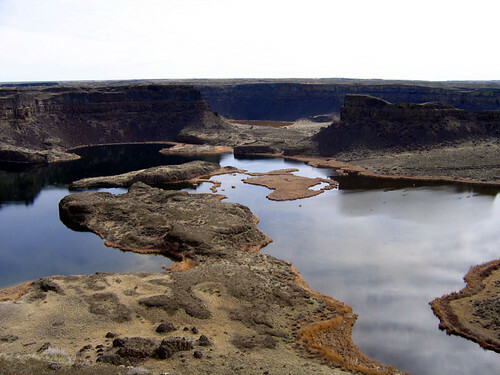 It is said that they were created when the Glacial Lake Montana burst from it’s natural dam and flooded the region (hence, the Channeled Scablands). Dry Falls was, at one time, the largest falls on earth. Bigger than Niagra. Wikipedia has an entry on Dry Falls that explains this geological wonder better than I can. If you would like to see the rest of the pictures from Dry Falls check out my Flickr set. Here’s a website that gives a nice description, with pictures, of the Missoula Flood and the Channeled Scablands.